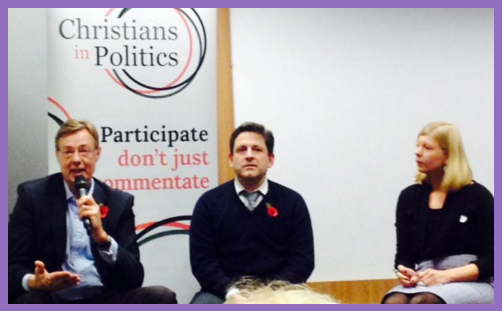 I genuinely expected to be disappointed when I first found myself at an event organised by a Christian political group. Four years ago I put a blog together after becoming frustrated with the weak Christian response to the Occupy movement’s demonstration outside of St Paul’s. I named it God and Politics in the UK and started writing about news stories I’d seen, attempting to present some opinions on them from a Christian perspective. But after I’d been going for a few months I decided it might make sense to actually find out first-hand what other Christians who shared an interest in the state of this country were up to. So having looked around on the internet a bit I decided to go along to a monthly prayer meeting organised by the Conservative Christian Fellowship. It wasn’t the fact that it was a Conservative meeting that interested me, but rather that it was being held at the Houses of Parliament and I was curious to know who might be attending. I’ve been to some pretty dull prayer times in my life and all I could imagine on the train journey there was being surrounded by a few posh people with grey hair praying for David Cameron using very dry liturgical language. As it turned out I couldn’t have been more wrong. The Chapel of St Mary Undercroft was packed with a wide range of ages, backgrounds and ethnicities. Over the evening we passionately prayed and worshipped, singing modern songs led by members of Hillsong London. The atmosphere was warm and welcoming and the focus was a spiritual revival for this nation. I came away blessed and excited. When I went to an equivalent meeting organised by the Liberal Democrat Christian Forum the following month, I found a group of mostly young people equally passionate and fired up to pray and serve God. It felt like I’d stumbled upon a beautiful secret. God was stirring many hearts and raising up committed individuals to serve him in the political arena through prayer and deeds. Since then I’ve got to know the leadership of the Conservative Christian Fellowship and Liberal Democrat Christian Forum along with Christians on the Left very well. What has amazed me most, even more than their faith, is the love and unity displayed across political borders. Despite their differences of opinion they are united as an army of God longing to see His Kingdom come in this country, including the corridors of power. The umbrella organisation for these three groups is Christians in Politics and this weekend it held its very first national conference. It was a great privilege to go along to speak and also to experience a wonderful time of fellowship with a diverse bunch of people (Harry Farley’s write-up at Christian Today demonstrates just how surprised some delegates were by this). To glorify God is to let our faith flow through every part of our life to the point where others can’t help but notice. So many of the people I met at the weekend clearly love God and the desire to fully live for Him has led some of them to become MPs, councillors and policy advisers because that is how they see themselves being advocates for the Kingdom of Heaven – not Christians who happen to be involved in politics, but servants of God called to bring His light into the places that shape our society. I came away mulling over the irony of it all; at a conference about politics, I had experienced far more unity of vision and far less church politics than I do at the average Sunday church service. Most Christians have little interest in engaging with the realm of politics because they see it as dirty and tribal rather than a mission field desperately in need of people whose principles are thoroughly rooted in God’s values. Yet in our churches, precisely because we’ve been reluctant to follow Jesus’ calling to get out of our comfort zones, we lose sight of the very essence of the gospel, becoming engrossed in petty squabbles and falling out with each other over matters of secondary importance. When churches spend as much time teaching and talking about looking outward, rather than just inward, and if those of us willing to listen to the guiding voice of the Holy Spirit put it into practice, it is inevitable that we will see God moving. The more we focus on God’s mission rather than ourselves, the more faith grows and our differences lose significance compared to the joy of serving Him alongside each other. If the bitter divides of politics can be melted through the love of Christ, then surely this is a sign that so much more that can be achieved in all of the spheres of our society and culture for the sake of the God’s Kingdom – if we are willing to fix our eyes on the author of salvation and respond accordingly.